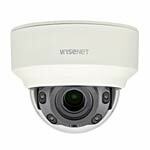 This Wisenet X series camera offers 120dB WDR, image stabilisation using gyro sensors and razor sharp images 24/7 with improved low-light performance. Using WiseStream II, the second generation of Hanwha Techwin’s unique compression technology, the Wisenet X series delivers the most bandwidth friendly camera range. There are also many other notable key benefits, including a variety of on-board analytics.